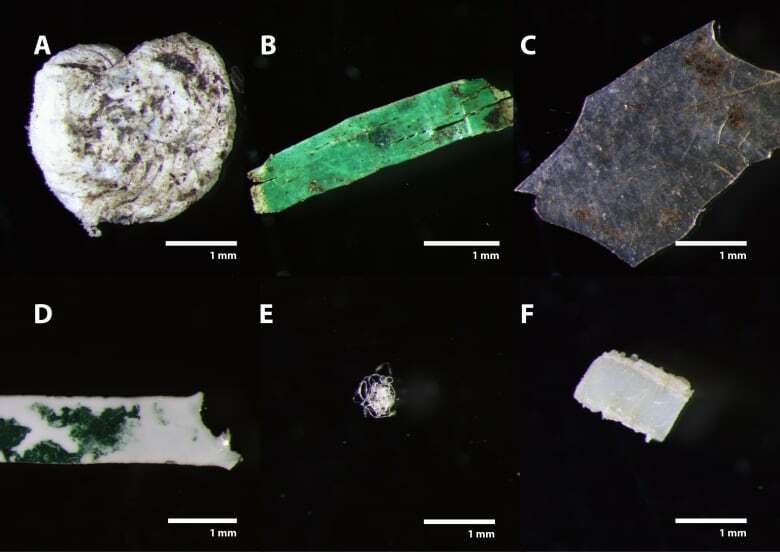 Tiny fragments of plastic are being found in oceans, freshwater and on agricultural land. Environmental scientists are sounding a new alarm about microplastic — tiny fragments of plastic pollution —contaminating much more of the planet than we were aware of, including the land where our food is grown. The issue of microplastics contaminating ocean environments has received a lot of scientific attention in recent years. Researchers have found it in practically every kind of marine environment: floating in open ocean, around most coastal areas, integrated into the sand in remote beaches, frozen into sea ice, and in deep water sediments. In all these environments they've found tiny pieces of fragmented plastic, ranging in size from a few millimetres to too small to be seen by the naked eye. But more recently, researchers like Dr. Chelsea Rochman from the University of Toronto have been working backwards to the source of this pollution. "We know about 80 per cent of it comes from land, and so we're starting to find that as we look upstream, we also find microplastics," says Dr. Rochman. This includes freshwater ecosystems like lakes and rivers, where microplastic can be as prevalent as it is in ocean systems, but also on land, including agricultural land. A German group found several different types of plastic contaminating green-bin organic compost destined for farmers's fields (Sarah Piehl, University of Bayreuth)A new study from a German team published this week in the journal Science Advances explains how some of this microplastic could be getting there. Dr. Christian Laforsch, chairholder for animal ecology at the University of Bayreuth, led a team that studied microplastic levels in organic compost. This compost is made from household organic green-bin waste, as well as similar material from restaurants, commercial kitchens, and supermarkets. It's commonly used in agriculture as a fertilizer. Dr. Laforsch's group tested compost made from this material and found it contained a significant amount of plastic. "We found between 14 plastic particles per kilogram of this compost up to almost 900 particles," he explained. This was, he suggests, likely a low estimate of the amount of plastic in the compost because they were only able to capture particles larger than one millimetre in size. "We maybe just analyzed the tip of the iceberg because there might be much more smaller microplastic particles below the size of one millimetre in our samples." 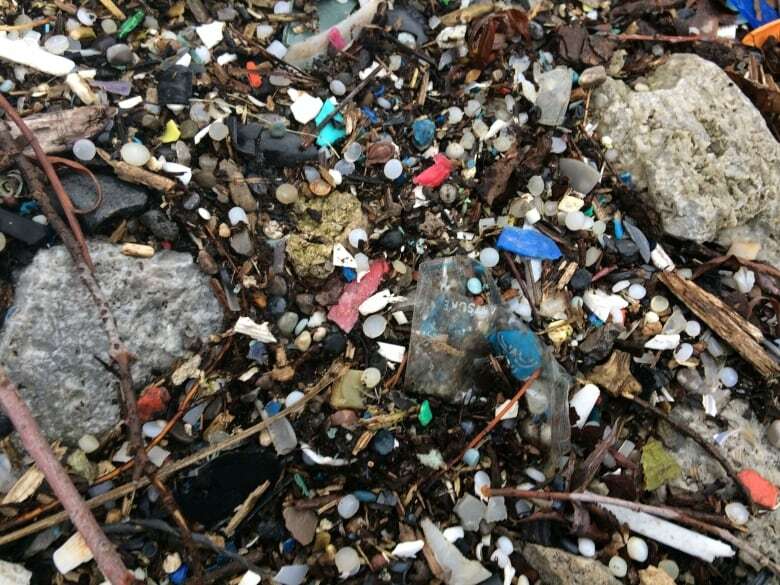 Plastic debris on a lake Ontario beach at Humber Bay Park in Toronto (Chelsea Rochman)"It's unfortunately not a big surprise," says Rochman, whose lab studies microplastics in freshwater and terrestrial environments. "Aside from the green bins being a source of these plastics onto agricultural fields, we also know that in wastewater treatment plants, we create the biosolids or the sludge, which is also sometimes spread on agricultural fields — and we know also that's a source of microplastics." The plastic that appears in biosolids from waste treatment comes from various sources, according to Rochman. Microbeads used in cleaning products have been one contributor, though they're now banned in Canada. Another major source is synthetic fibres which enter the system as lint from clothes washing or from cleaning wipes. Plastic garbage and debris, including fragments of tire rubber, also enter the wastewater stream — and thus may ultimately end up in the water treatment system. The implications of this for animal and human health haven't seen much scientific study, but it's clear that we're being exposed to various plastics in our diets. Researchers have found evidence in ocean systems of animals consuming microplastics, and it has been found in seafood — fish and shellfish — sold for human consumption. 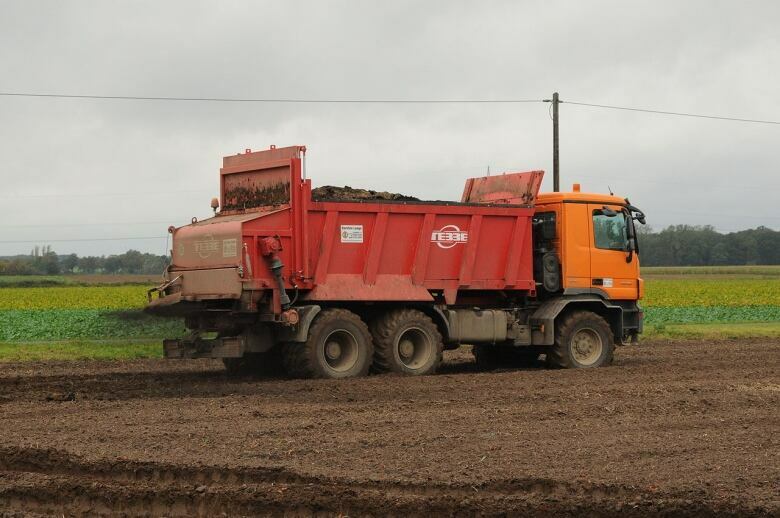 Biosolids or sewage sludge application on fields in Germany. This material has also been shown to contain microplastic, much of it fibres from clothes washing (Sustanable Sanitation Alliance, cc-by-sa-2.0)"For agriculture or terrestrial, that's a big unknown," says Rochman. One recent laboratory study looked at exposing earthworms to microplastic in soil and found that it deceased growth and increased worm mortality. Dr. Rochman says additional evidence from studies of marine life is not reassuring. "There is research showing it can decrease reproduction, and so potentially change population sizes of animals," he explains, as well as promote tumours in the liver of fish. "But we also are still learning what it can do." Dr. Rochman thinks awareness of this problem is growing, as is the willingness to engage with it. Environment Minister Catherine McKinnon recently announced that Canada would be leading a push through the G7 for a "zero plastics waste charter," that would encourage more recycling, reuse, and reduction of plastic waste. 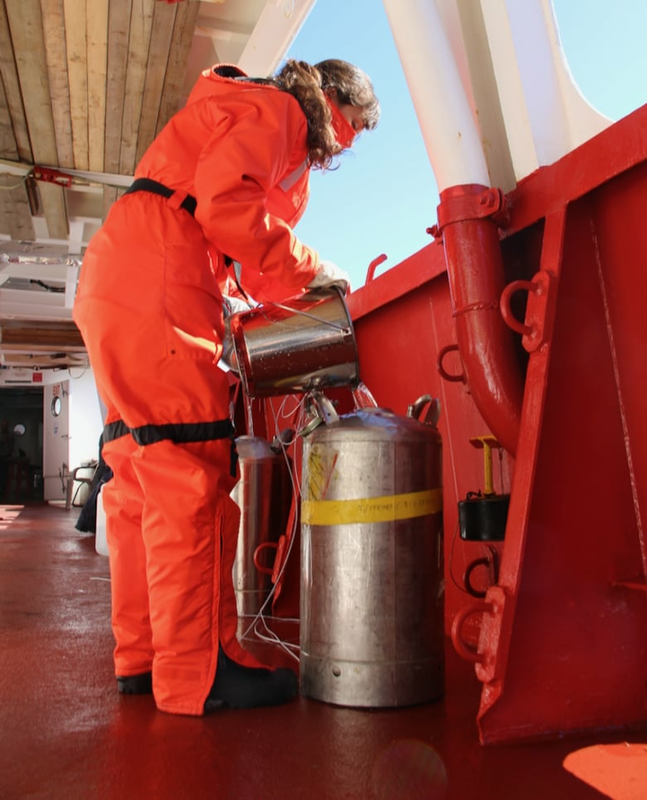 Dr. Chelsea Rochman sampling water for microplastics on a research trip in the Arctic (Chelsea Rochman)Dr. Rochman hopes this will be the start of a bigger effort. "I think now the mindset's changing a little bit to think of it like some other contaminants as a global contaminant … If it's a global contaminant we have to focus not just on the oceans, but also freshwater and terrestrial ecosystems." When it comes to plastic in organic compost, people are the problem, according to Susan Antler from the Compost Council of Canada. She represents companies that process and produce food waste into compost. These firms are required to separate out plastics that are permitted in green bins, like plastic bags, diaper shells. Compost is also screened for larger fragments of foreign material, but it's impossible with current technology to get all the microplastic out. The real solution is changing behaviour - and preventing plastic from getting into the compost in the first place, says Antler. "People are looking at their green bins as garbage - not as material going back into the soil." Plastics - a new "Silent Spring"